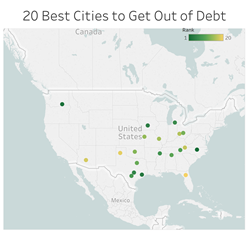 A new study from Student Loan Hero identifies the 20 best and 20 worst cities for residents to get out of debt. “Living in one of the top 20 best cities gives you a disposable income of $18,000 left over, on average, after taxes and basic living expenses are paid. That’s a huge boon to residents of these cities who want to get out of debt faster." The key to paying off debt faster might be living in a city with high wages and a relatively low cost of living, a new study finds. This research from Student Loan Hero, a financial education site, compared average wages to local income taxes and costs of living. The study calculated the average disposable income residents can expect in 159 major U.S. cities and ranked them accordingly. The findings identified the top 20 cities where residents have more money left over to get out of debt. -- Half of the top 20 cities are located in states that don’t levy a state income tax. Another Student Loan Hero study found that living in a state with no income tax saves residents an average of $1,977. -- The top 20 cities have low costs of living relative to wages and national averages. Only one city has a cost of living higher than the national average (by just 0.8 percent). In addition to the best cities to pay off debt, the study also identified the 20 worst cities for paying off debt. We surveyed more than 159 cities but excluded cities for which any of the above data points were unavailable. We also cross-checked city locations and in some cases substituted data points from neighboring cities within 50 miles. For more information, visit https://studentloanhero.com.